Goa is located midway down the west coast of India some 500 kilometers south of the bustling metropolis Bombay. The tiny state, measuring just over 3700 km2 in area, shares its borders with Maharashtra to the north and Karnataka to the east and south. Goa's 105 kilometers of coastline is edged by a seemingly endless succession of pearl-colored sun-soaked beaches caressed by the warm waves of the Arabian Sea. The scalloped fringe of the coastal belt is interrupted here and there by river estuaries which flow into the heartland. There the landscape becomes increasingly hilly, dotted by sleepy villages nestled among spice plantations, cashew groves and thick jungle. 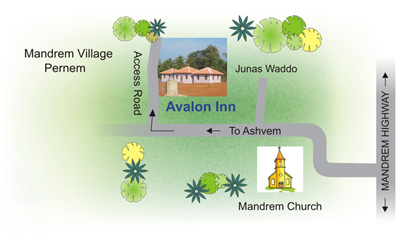 Mandrem is situated in North Goa, 60 kilometers from the airport and 20 kilometers from Mapusa, the nearest town. Well away from the mainstream tourist strip, the area north of the Chapora River is still pristine in its beauty. Mandrem retains its natural charm and offers guests a view into village life where prawn farming, fishing and agriculture are a way of life. During the months of October thru May, Goa has a tropical maritime climate with warm sunny days, pleasantly cool evenings and only a trace of rain. The temperature on the coast ranges between 20 and 32 degrees centigrade. Given our proximity to the sea, the trees in our garden afford both shade from the sun and a refreshing breeze on more humid days. The rainy season lasts from June thru September during which Goa falls under the influence of the southwest monsoon.